The ethnic groups of Rwanda today still struggle with the legacy of the genocide in 1994. In the search for justice and peaceful coexistence, Espérance bridges the ethnic divides of Rwanda through education and social programmes such as Football for Peace and Anti-AIDS. The organisation uses football not only to reconcile differences within the population, but also to raise awareness of dire issues that young people and their communities face. 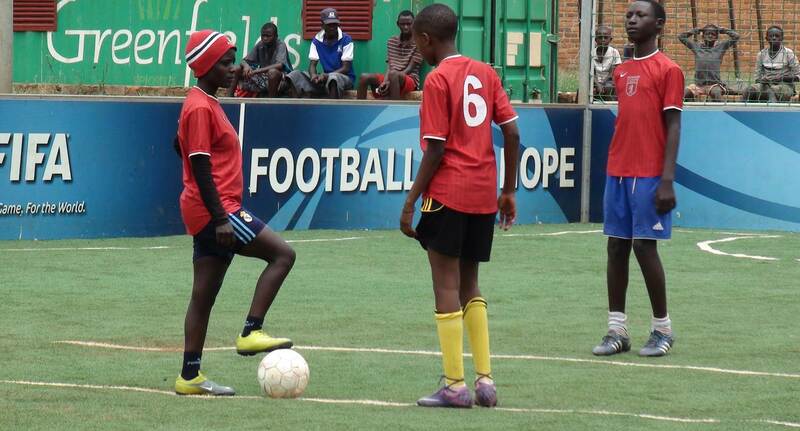 Football tournaments are run in conjunction with AIDS awareness activities. Thousands of young people are trained on the football field each year and many more partake in other Espérance activities. Participants are not just educated; they are trained to be educators themselves. Successful Root-Tournament:‘Football for everybody’ was the moto of 20 children from Esperance on the way to the first U17 Root-Tournament, which took place on the 13th of May at Green Hills Academy. 9 teams and about 100 children were gathered to take part in two different competitions. Of course, our girls- and boys team had the winning mentality in their minds as well, but the tournament was mainly about children with diverse backgrounds playing against each other as fair sportsmen and -women. Mu rwego rwo gufasha no guha amahirwe yo kumenya siporo zitandukanye, urubyiruko rwitabira siporo na gahunda zitandukanye za Esperance n'urubyiruko rwo mu Karere ka Nyarugenge bitabiriye imikino yaranze umunsi witiriwe Athletic Sports, ku wa kabiri taliki ya 4 Mata 2017, mu Kigo cya Kimisagara Football for Hope. Ku nkunga n'ugufatanya hamwe n'abakorerabushake bakomoka mu gihugu cy'Ubudage Moritz na Philipp, kuri uwo munsi urubyiruko rwasiganywe mu kwiruka (Relay), rurushanwa mu gusimbuka umurambararo, gusimbuka urukiramende no kunaga intosho. Ibyishimo byari byose mu rubyiruko. Football, icyiciro cya kabiri 2016-2017: Nyuma y'imikino ine imaze gukina, kugeza ubu Esperance Sporive de Kigali iri ku mwanya wa 8 n'amanota 4. Ikipe ya mbere mu itsinda ryayo rya B ni Miloplast ifite amanota 12 ikaba inganya amanota n'isonga FC, mu gihe United Stars iri ku mwanya wa gatatu n'amanota 10. Dore uko amakipe akurikirana: Miroplast Fc 12, Isonga Fc 12, United Stars 10, Heroes Fc 09, Etoile de l’Est 08, Rugende Fc 07, La Jeunesse 04, Esperance SK 04, Intare Fc 04, Gasabo Utd 01, Sec Fc 00. Nyamara ariko abakinnyi ba ESK bakomeje kugaragaza umuhate mu guharanira kuzamura ikipe. On Friday morning, the 25th of November a special day was waiting for our U17 Team. 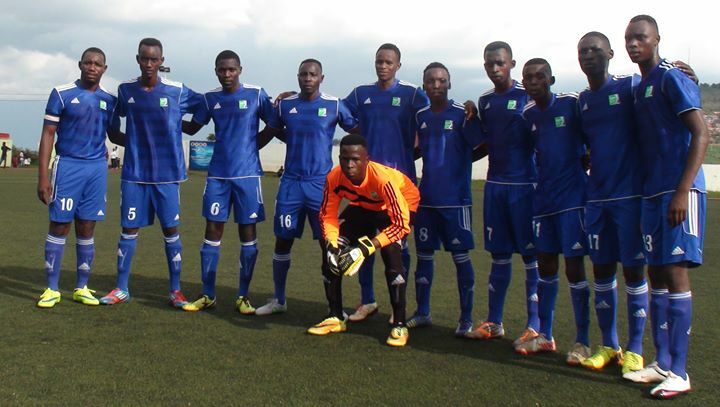 This day a match against the U17 Team of “Vision Jeunesse Nouvelle” in Gisenyi was organized. Coach Emmanuel Dushime, Dominique Uwimana, Job Uteretsimfizi, Moritz Persitzky and Philipp Schönlaub, the two Volunteers from Germany, and 15 players from Esperance’s U17 team were gathered at the Bus station at Nyabugogo. For all players, it was the first time to go to Gisenyi. Thus even the bus trip was an exciting experience. Football, icyiciro cya kabiri 2016-2017: umukino wari wahuje Esperance Sportive de Kigali na Miloplast ku cyumweru gishize taliki ya 27/11/16 ku Mumena I Nyamirambo wasubitswe nyuma y’imvura nyinshi yaguye nyuma y’iminota 27 umukino utangiye. Nkuko mubibona ku mafoto, imvura imaze guhita umukino ntiwakomeje kubera ikibuga cyari cyuzuyemo amazi menshi. Esperance Sportive de Kigali ikaba yari yabonye igitego cyayo cya mbere cyatsinzwe na rutahizamu Harindintwari Theoneste ufite ubunararibonye muri ruhago. On the 10th of December, the Rwanda National Olympic and Sports Committee and Root Foundation - Rwanda aim at hosting an event for vulnerable children in collaboration with other likeminded organizations (See Below) working to promote the rights and healthy development of children in Rwanda. The idea is to gather children (and their parents) associated with different organizations working on the ground and offer different activities, entertainment and joy including inclusive sports, activities, games, art workshop, and performances with participation of the children. Nitwa Moritz. Mfite imyaka cumi n'umunani. Ndi umudage (My name is Moritz. I am 18 years old. I am German).These first words (and some more) I learned in the last few days while starting the kinyarwanda course with Dominique Uwimana- our mentor. I am one of two new volunteers at Esperance for one year stay. On Tuesday, the 4th of October, we were lucky to have welcomed several students performing Hip-hop songs. It was a pre selection for young artists expressing their ideas and opinions about children rights. This project is connecting different organizations which work with young people from eight countries: Rwanda, Kenia, Germany, Cambodia, Brazil, Paraguay, Israel & Palestine and Chile. In each country similar events of Hip-hop performances are taking place. 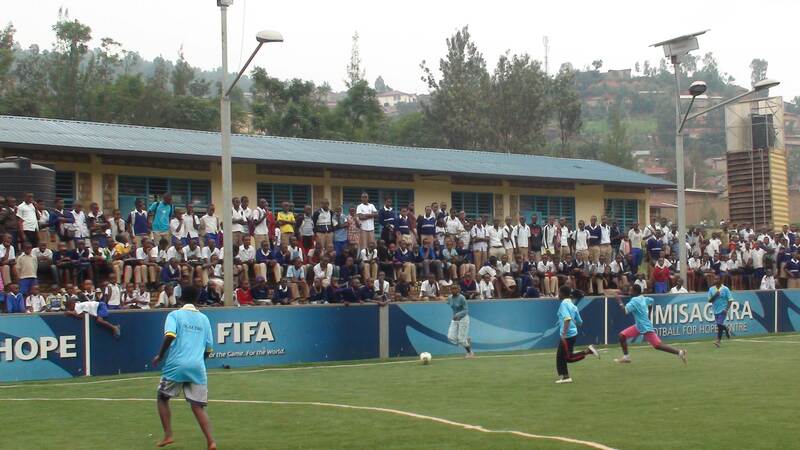 In Rwanda Esperance organized this event at Kimisagara Football for hope Center. "Involving young people in solving issues which affect them, treating them as resources and not as problems, is a powerful transformation of our communities. 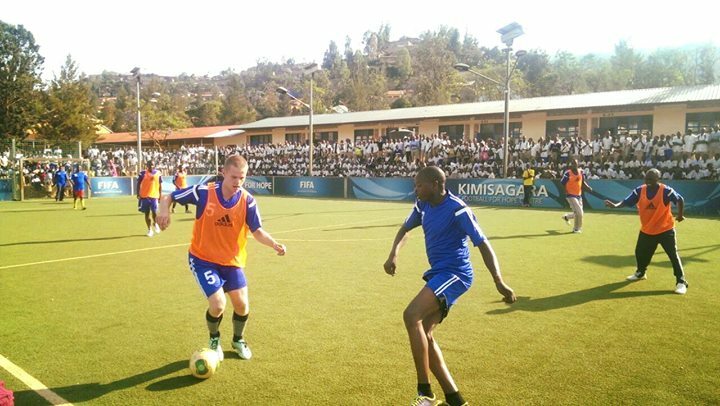 Esperance and Kimisagara Football for Hope Center provide resources to all young people of Rwanda and from the Great Lakes Region to realize their full potential as productive and responsible."